In our new 'Christmas Cracker' series, each morning through to Christmas we will bring you a top insight from one of our contributors. These will be diverse and could be a macro call, sector view, stock idea, or even some useful tech. Today’s insight is from Simon Shields, Monash Investors Limited. One of the advantages of investing Pre-IPO is the access to company information which allows a level of due diligence simply not possible in a listed market environment. This was critical for a Pre-IPO investment we made into a company that has now listed on the ASX, Telix Pharmaceuticals (TLX-ASX). Investing in the Biotech space is a high risk / high return prospect, and therefore an investment space where we are highly selective. The level of due diligence we were able to undertake Pre-IPO was critical to informing our decision to invest. Telix is looking to establish itself as a leading player in the molecular targeted radiation (MTR) market. So what is MTR? In simple terms, this is direct radiation of cancer at a molecular level. A number of cancers have specific molecular “targets” unique to that type of cancer therefore the idea is to develop a targeting agent (i.e. small molecule or antibody) that will specifically bind itself to the “target” on the cancer cell and nothing else. 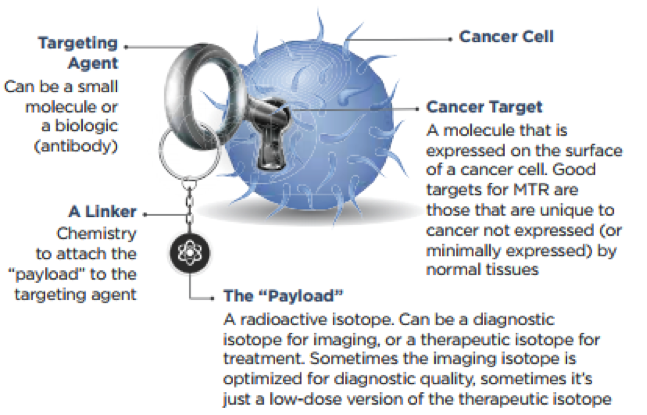 Then a radioactive isotope is linked to the targeting agent and delivers the radiation directly to the cancer cell. Depending on the isotope use, this can either image the cancer or provide a therapy. The approach offers numerous advantages. It has the systemic reach of chemotherapy but without the indiscriminate toxic chemistry; the killing power of radiation but brought into the closest possible contact with the cancer; and the selectivity of targeted therapy without the reliance on complex biological interactions. In short, it is a promising area of medical science, overcoming the drawbacks of other forms of treatment. The most advanced of these programs is TLX-250 - Renal cancer imaging. The targeting agent in this program was used in a previous phase 3 trial with excellent diagnostic performance. However, imaging was not the end point of this trial and therefore the FDA has required a confirmatory trial as a standalone imaging treatment. Given that it has already demonstrated this in a previous trial, the prospect that TLX-250 will be approved is high in our view. While Telix is currently pre-revenue, given the advanced stage of TLX-250, it is expected that Telix will start to generate revenue within 2 years. This is also a somewhat unique investment attribute versus other Biotechs where revenues are not likely in the foreseeable future. Telix has a strong management team with the right blend of medical/industry experience as well as commercial expertise. In any company management is key, arguably more so in a Biotech. While Biotech share prices tend to be volatile the combination of this many programs at relatively advanced stages of development, the associated newsflow, with the prospect of revenues within 2 years, with such a modest market capitalisation ticks many boxes. If you would like to receive further insights from Monash, you can subscribe to our monthly newsletter here. Great company for the founders and pre IPO investors. Founders receive all shares for zero consideration and the pre IPO investors at 17 cents. The rest of us are now in deep s...t, the stock is trading below IPO price with no assets to show. The CEO was boasting in his roadshow and newspaper interviews that they were envisioning a multi-billion dollar company in Telix and indirectly comparing it to Advanced Accelerator Applications recently acquired by Novartis for 3.9 Billion. Well, the reality is different Telix IS NOT Advanced Accelerator Applications. which was bought by Novartis for 3.9 Billion. 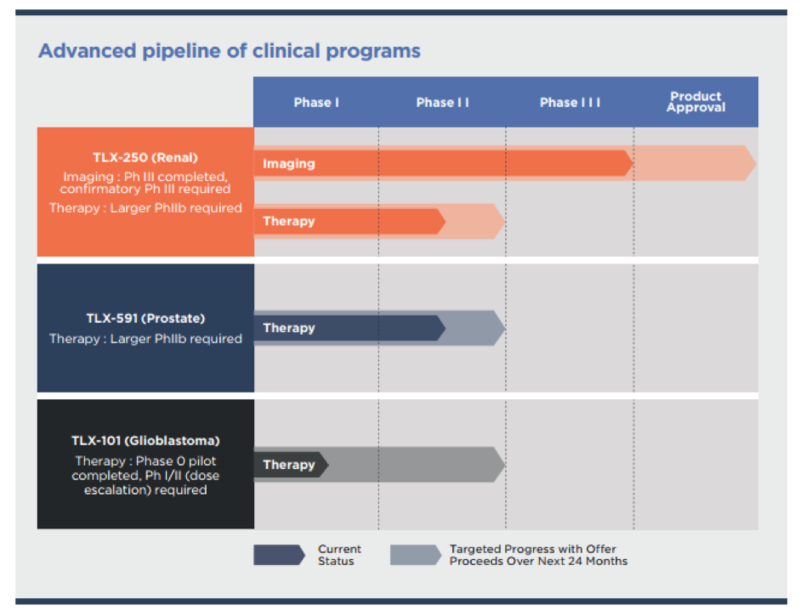 Oncosil is better value to Telix around 18 cents and at least its very close to a European regulatory approval.